Choosing a Survival School – Trail Blazer Survival School, Inc.
You won't regret choosing Trail Blazer Survival. Have you ever tried searching for a survival school online? It can be a daunting task, and even a bit overwhelming. You want to get the best training you can for your money, and understandably so. 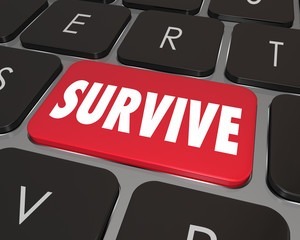 With all the hype of the survival industry there are so-called survivalist opening schools everyday, and it is important that you don't get fooled into their gimmicks. To avoid wasting your time and investing your resources in the wrong places, I have written this article to encourage you to consider your options when choosing a survival school. This is probably one of the most important questions to ask. You don't need some TV Star, or instructor who was raised by wolves or fantasy characters. You need an instructor with a background of professional training and experience. It is important that the instructors have integrity and strong moral character. Find people who value your time, and treat you like you matter. Our instructors are trained and certified with years of experience in the bush. They are also Godly men, who have strong healthy families, and are active in their community. Does the school own their own land, or are they using leased or public land? Does their property allow enough space and diversity for adequate training? What accommodations do their facilities provide? These are often questions that students don't consider when it comes to choosing a school, but they are important ones to ask. You don't want to find yourself spending hundreds of dollars on a course to end up training in a field on the side of a busy highway. The facilities will distract or enhance your training. Be sure the environment is conducive to learning and offers a wilderness immersion experience. Our campus consists of twenty-two acres of beautiful forest with springs and a small lake. 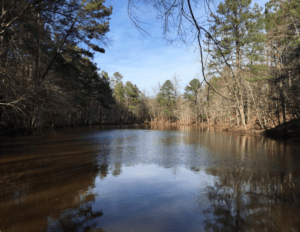 The property also connects to the Sumter National Forrest. There is a central camp with a fire pit, potable water station, outhouse, and other camp accommodations. How Much Do Their Courses Cost? Money is huge factor, but don't short change yourself by being cheap. If it seems too good to be true, it's probably because it is. $25-50 for training per day sounds like a GREAT DEAL, but it should raise caution. There is a reason those courses are so cheap. The reality is you get what you pay for. Quality training can be expensive, but it doesn't have to break the bank. Professional instruction averages around $100-125 a day. Because of this we provide multiple options from day, weekend, and week long courses to meet any budget. Also, we regularly offer discounts and promotions to help individuals keep cost down. What Classes Do They Offer? Be sure the school you are researching has a good variety of options, but also a standardized core training course. Workshops and day classes in various subjects are great, but schools without core classes are less likely to offer structured programs. Standardized courses ensure that students receive adequate training without the mishap and oversight which lead to vital skills being skipped or left out. Our classes are structured yet organic to allow for a creative learning environment where students receive full instruction, and hands on training where they can actually retain what they learn. 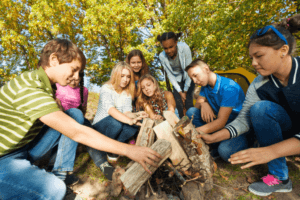 We offer a core Wilderness Survival Training Course that is designed to build on each skill, and leave the student confident in their abilities. I hope this article was of some assistance, and will aid you in choosing the perfect survival school that will meet your needs. If you have any questions, or need any assistance be sure to contact me. I won't steer you wrong even if it means recommending a different school to you. I am confident you will make the right choice, and I can't wait for opportunity to train with you. I know you won't regret it. Trail Blazer Survival School, Inc.